Sun and blueberries has started making a big appearance. 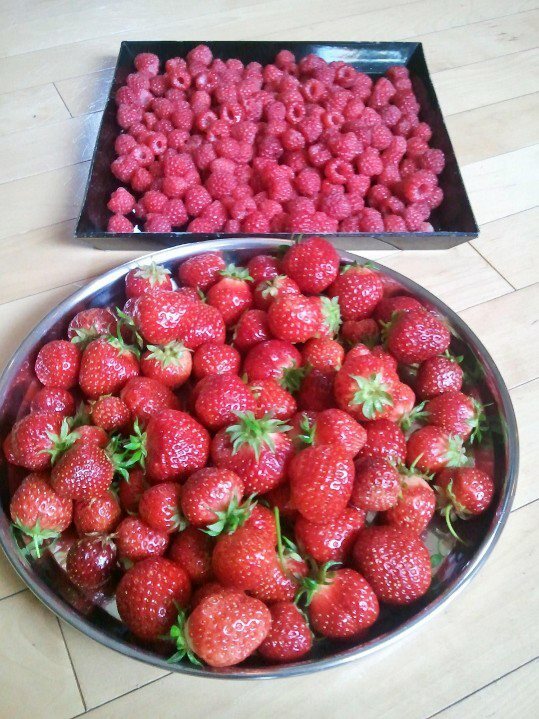 Berries are still big in production. 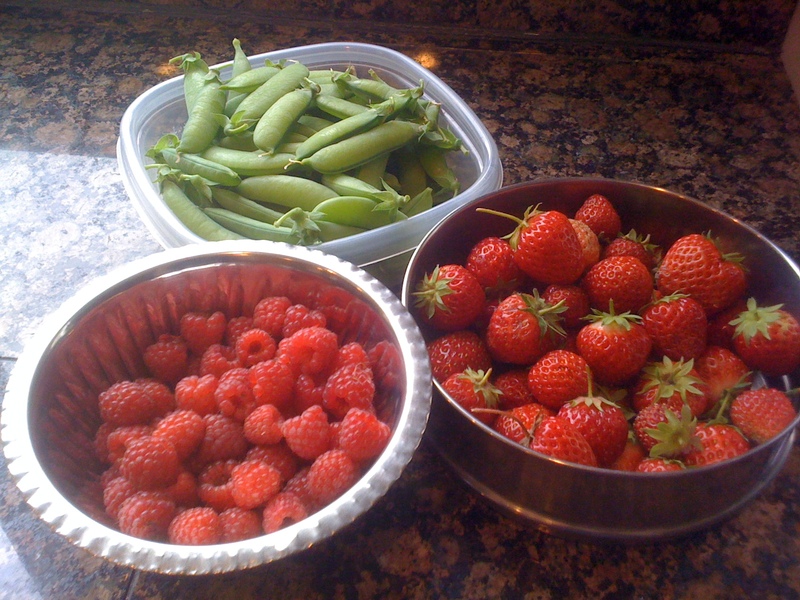 On Tuesday, we picked strawberries raspberries and peas. 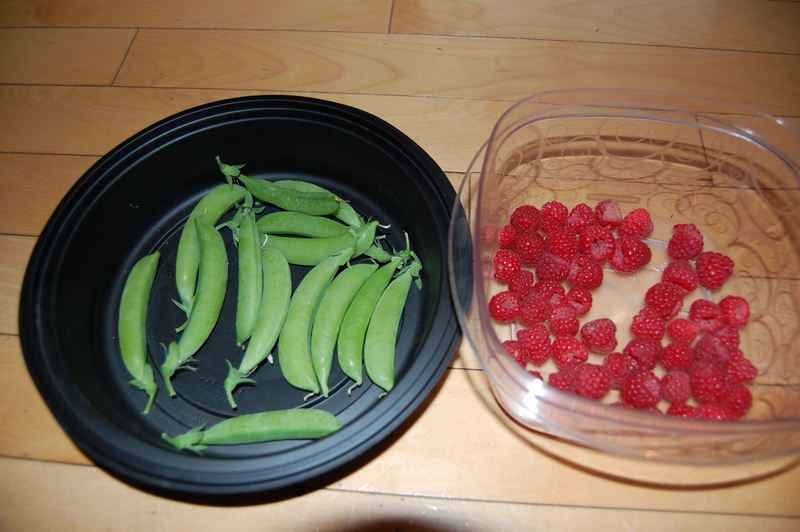 Thursday brought in more raspberries and peas. I noticed few blueberries ripening last week, I waited for a 1-2 sunny days to make them fuller and sweet. 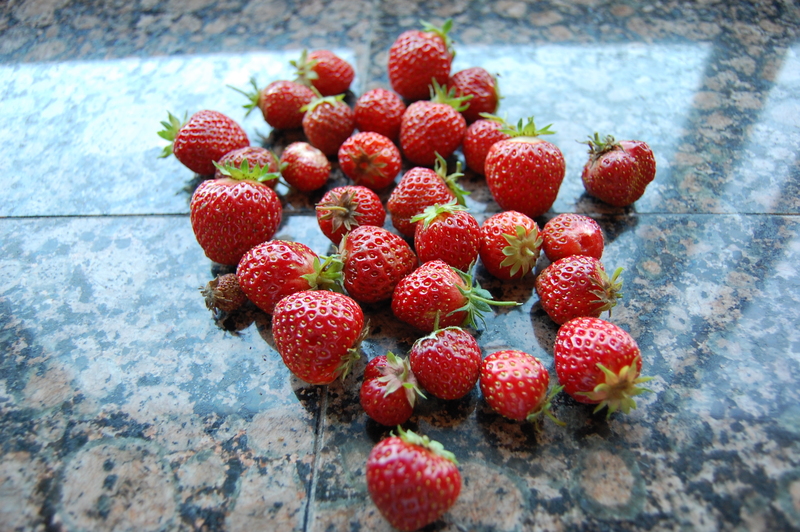 Picked few along with usual strawberries. Birds are eyeing blueberries, I had to protect with a wire net sheet. hope it helps. While driving to work, I noticed a cool thing couple days back. 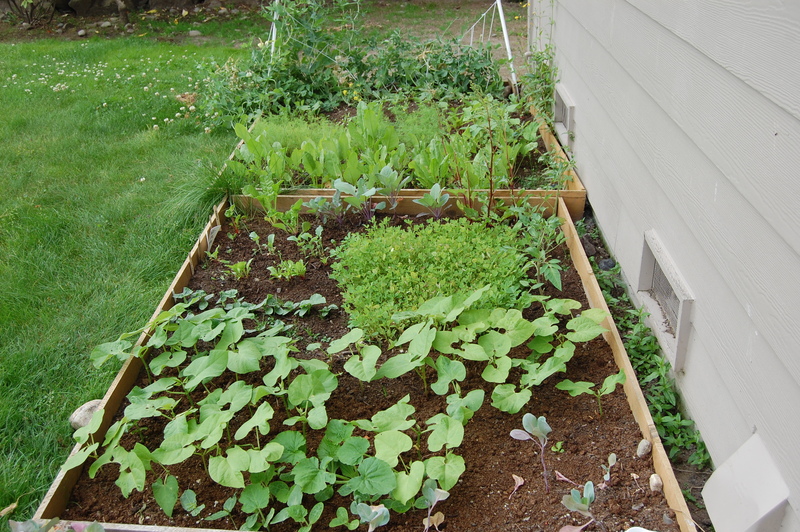 Someone along lake Sammamish has a big vegetable patch facing the road. He has big Blueberry patch, saw that he hung a kite on a long pole. Cool breeze from the lake has the kite flying all time deterring birds, very cool indeed. All plants are liking warm weather we have had for last 10 days. It’s been in 70s and occasional 80s for last 2 weeks. I am suddenly seeing seeds germinated (which I forgotten that I ever seeded) , beans showing visible new growth day by day and much more. Here’s mini tour of the garden. 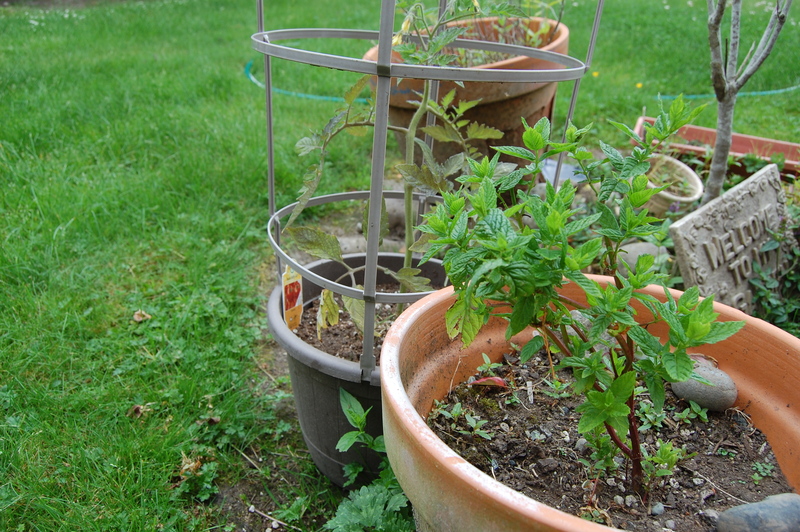 Here are 3 smallish potato plants. One is volunteer and other 2 are planted. 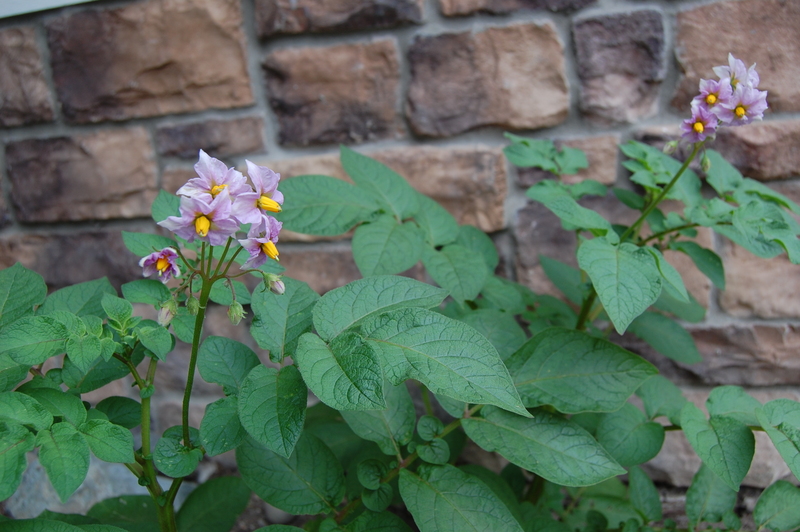 Potatoes are flowering; I’ll dig up when potato fruits are set. 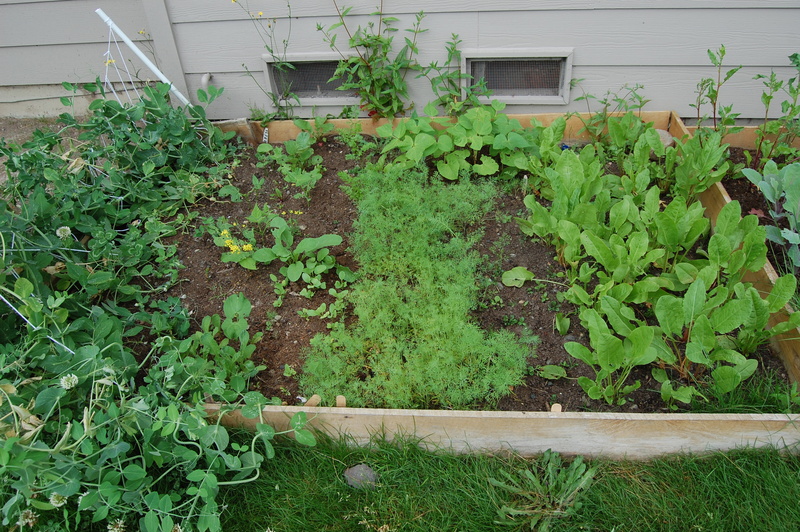 This is one of the unkempt raised beds. There are few things growing on there, I have to weed in and plant fall/winter veggies in here. 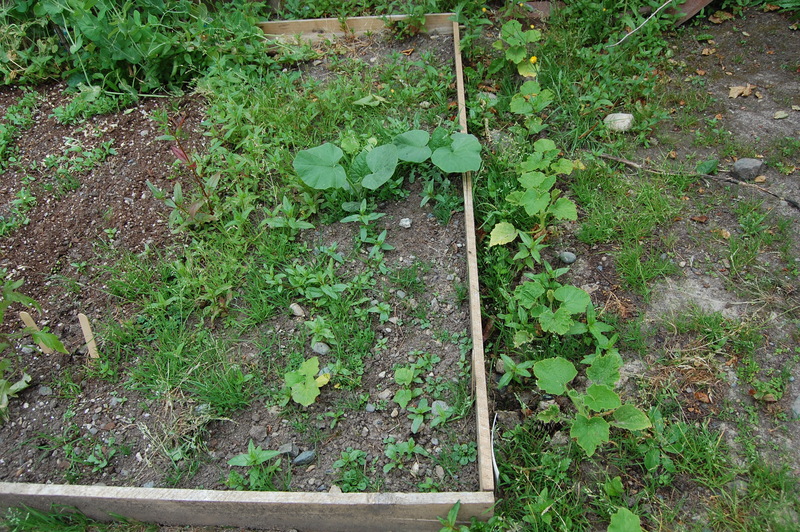 Few buttercup squash is growing on side. 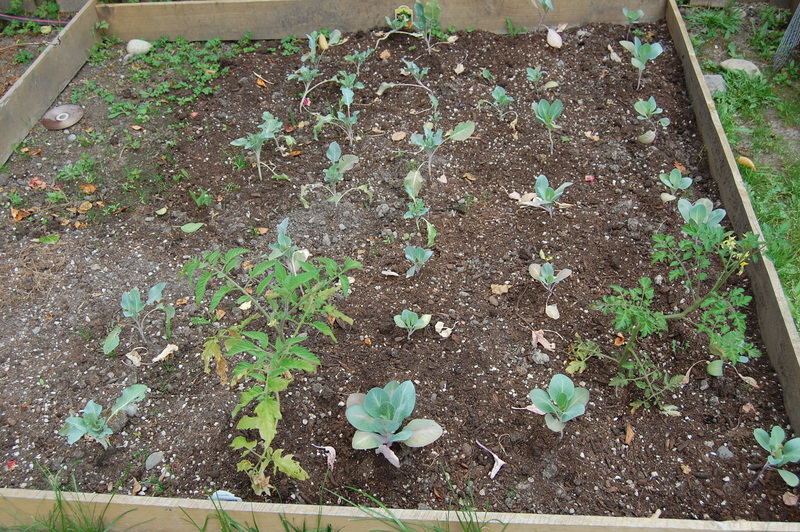 This side has cabbage and cauliflower with one tomato plant. 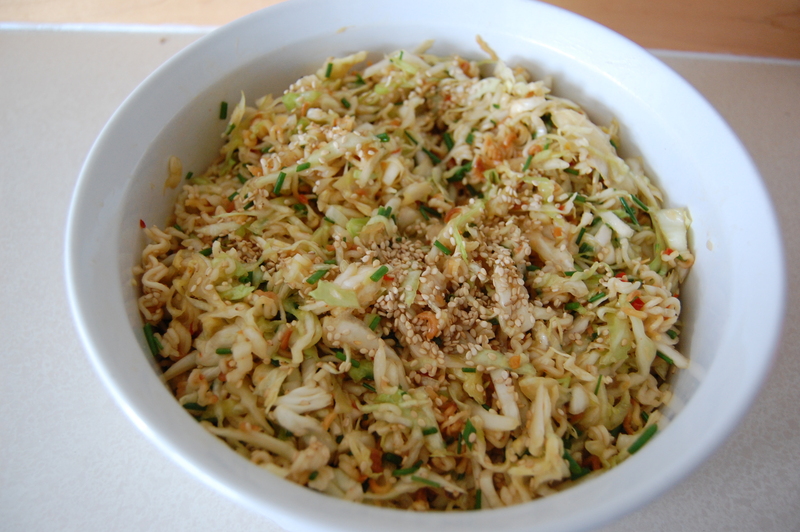 Cabbage is ‘early Jersey Wakefield’ type. Bed 1 has pea plants on left side, these are planted back in Spring, most are picked by now and vines are slowly dying. I’ll plan to clear them in next 10-15 days. Next to it is random radishes and few beans planted. 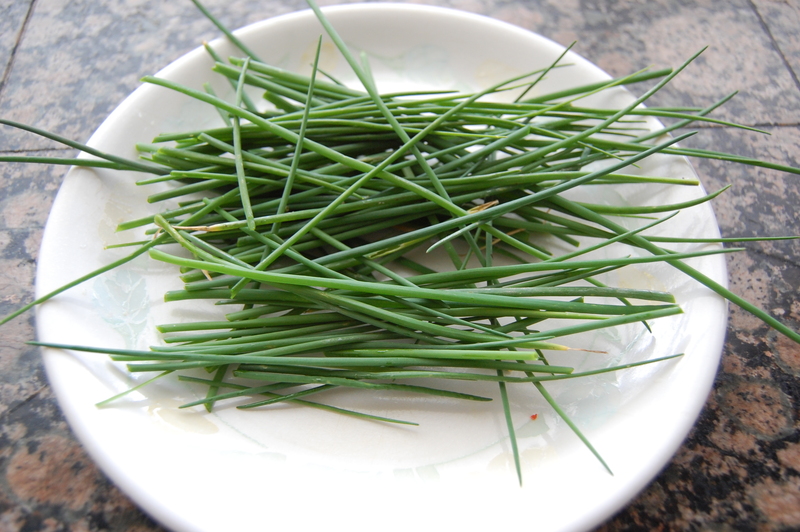 Middle is dill greens; these are close to being harvested. 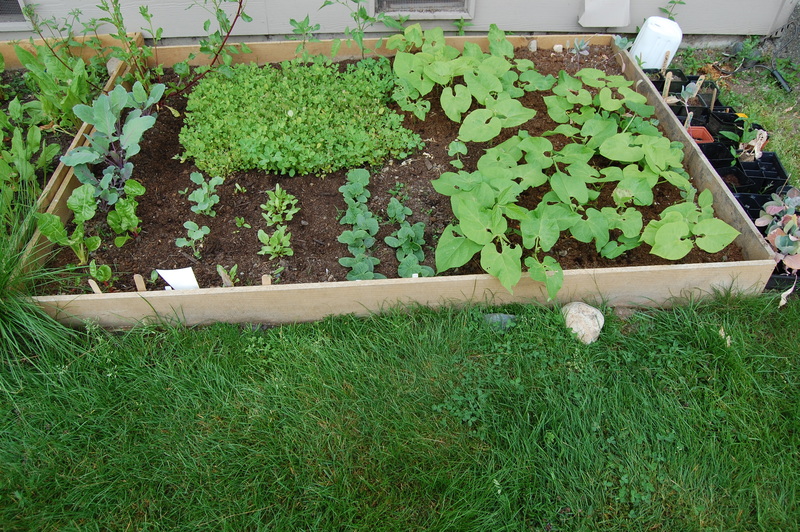 Right side of the bed is green Sorrel. Here is Bed 2. 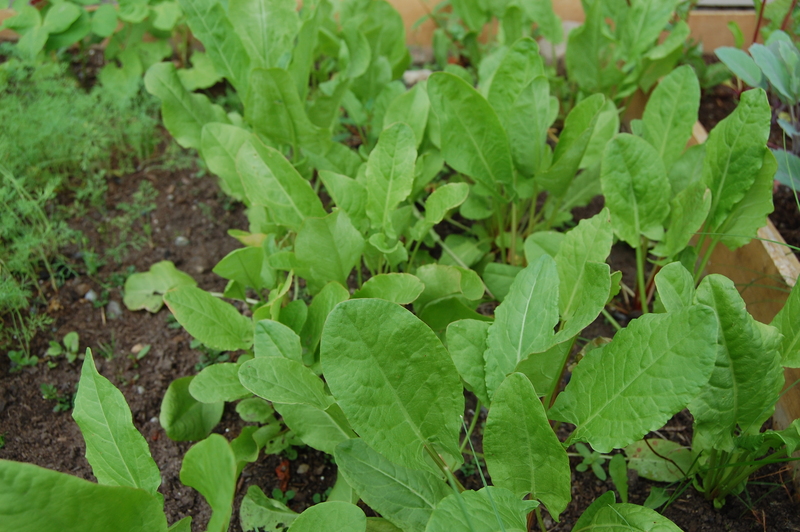 From left – purple Kohlrabi, Chard seedlings, Beet seedlings, Cucumbers and Green beans. Containers with Mint, Tomato and shoebox onions. Big space in my backyard is for berries. Side yard has big strawberry patch which is in full production mode right now. Raspberry is crowding in the space by the fence. It might seem like all I post is berry harvest but it’s been that way for past weeks and may continue for 1-2 more. 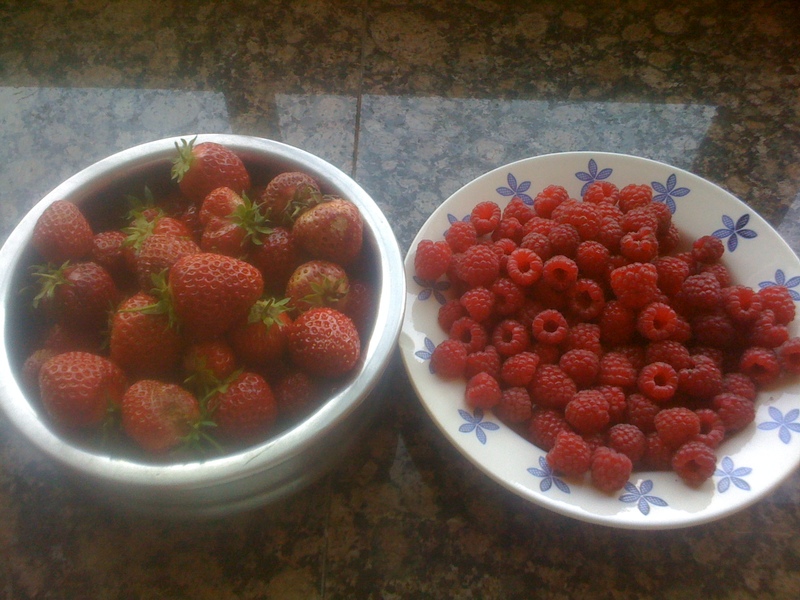 On Sunday, we picked strawberries and raspberries. 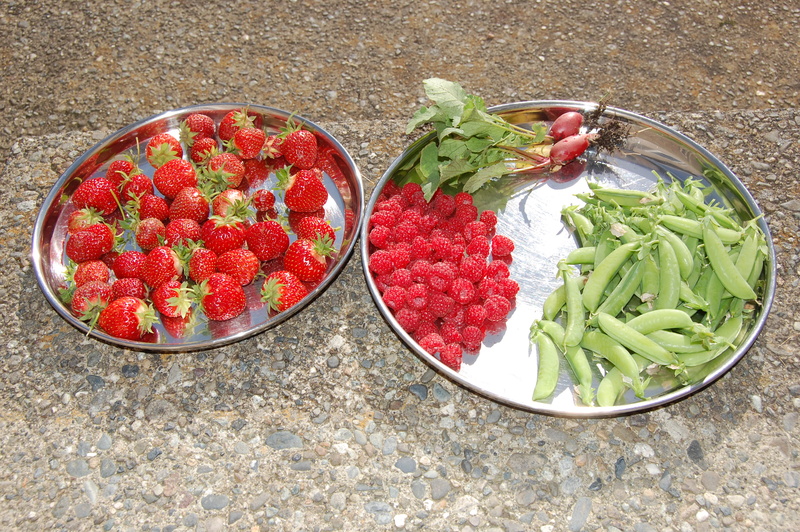 It was a huge harvest, photo above is what lest after snacking, sharing with visitor and neighbor. 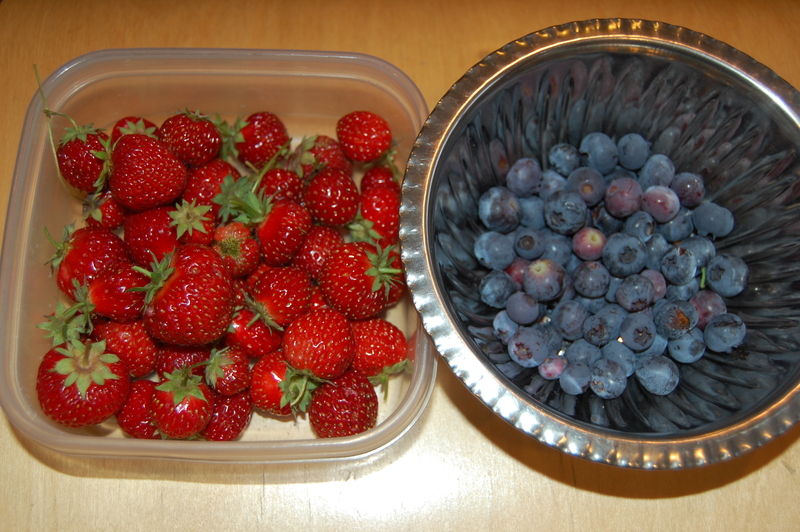 Few more berries were ripe on Monday. 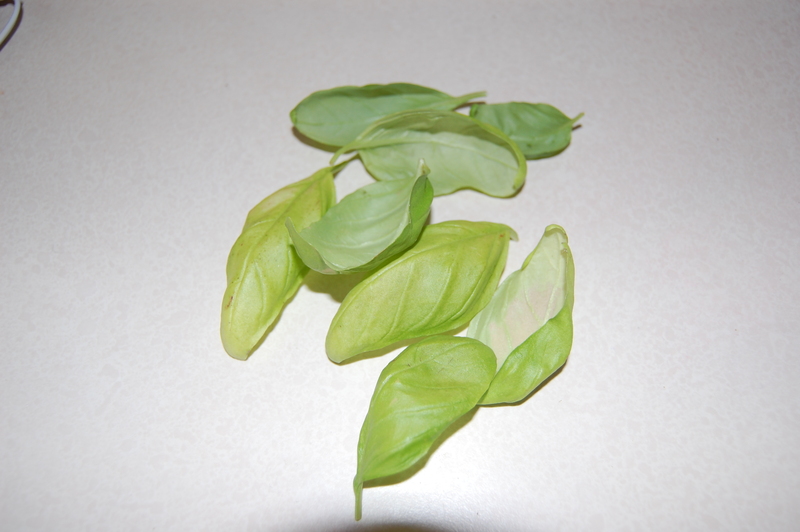 I had not picked peas for some time, pea vines are slowly drying. Even though I am growing shelling peas, I like to eat the whole pods for snack. I don’t wait till it all swells up, I am picking peas when they are smaller. Thankfully variety I am growing isn’t fibrous, I am able to eat whole thing. 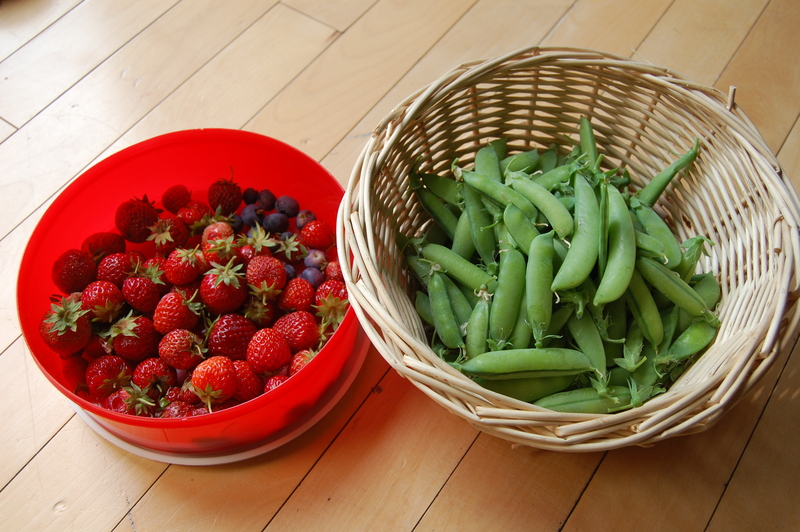 Tuesday I picked basket full of peas and again strawberries. 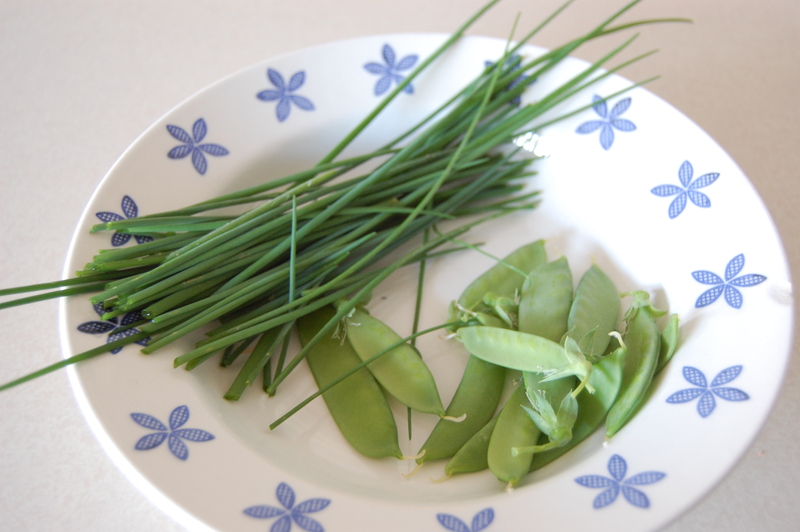 I made Pasta Salad for potluck event on Friday; quick run to backyard gave me few young pea pods and chives. 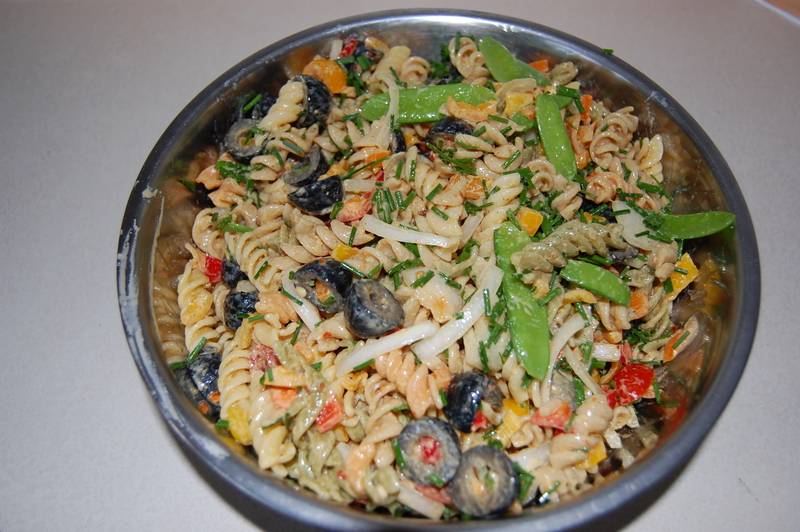 All went into Pasta Salad. 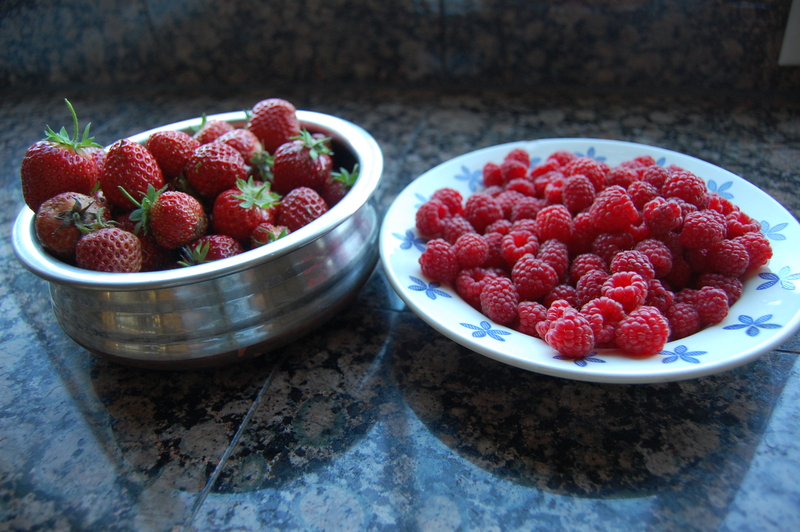 To round up the week, we picked raspberries and Strawberries. Of course, we are not able to consume all the berries. Most of it is going into the freezer. Summer finally arrived in NW on July 4th, a good start to the summer. In our garden berries are making a huge appearances. We are picking berries almost every day. 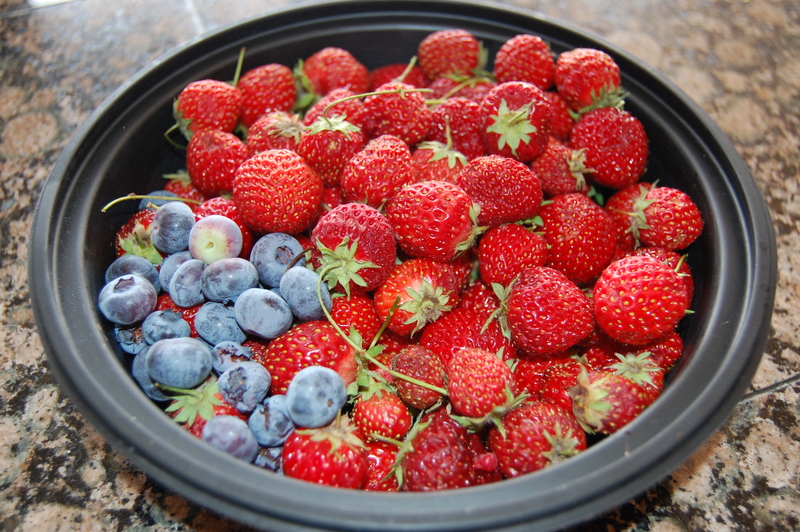 We picked big bag full on Thursday – Strawberries and Raspberries. Raspberry plants need support? I never had heard of but outer few plants are heavy with fruits and are almost bending over and touching the ground. We got 3 small plants from a friend 2 years back, this is 3rd year berries are in production. Every year raspberries send out new plants, our gardener mistakenly hacked few plants by mistake earlier this year. We have 5-6 producing raspberry canes this year. Original 3 have died down after producing for 2 years. This is a new recipe I tried this year. 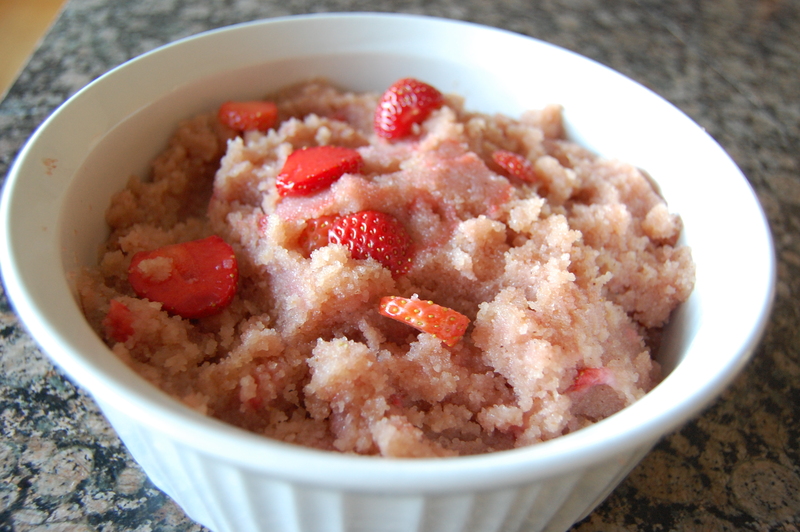 I added sliced and slightly pureed fresh strawberries to Rava (just like when I add Bananas). 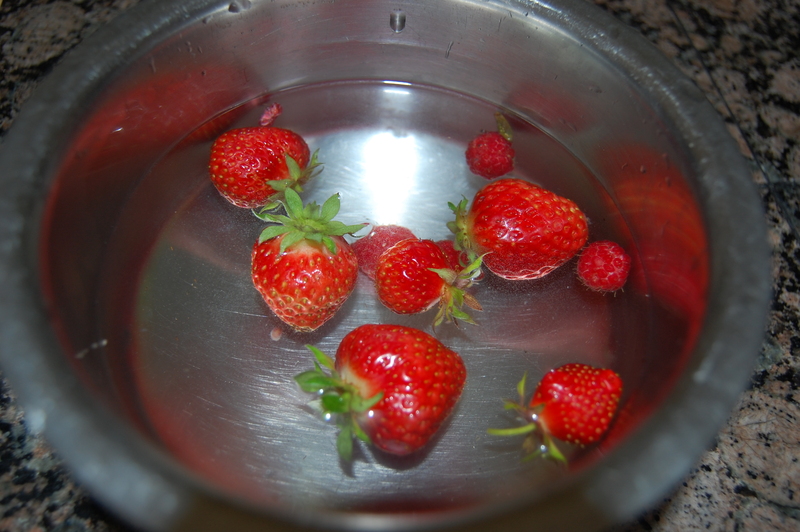 It cannot get any better – eating Strawberry dish with fruits picked an hour earlier. First time this year, yes – first time for 2012, I watered plants and lawn. I hope warm weather stays. Today we picked lot more strawberries and raspberries. No picture though. Call it a fluke or call it a summer, SUN finally came out in Pacific Northwest. We welcomed its rare appearance here. Sammamish farmers market was in full and crowded last Wednesday; fruits from Yakima Valley are rolling in – Cherries and Apricots along with early squash, peas, and cabbages. Tomatoes and warm weather fruits are yet to make an appearance. 2 days of preview summer was quick over and it turned overcast/rainy and cold again over the weekend. Hope 4thJuly makes official start to PW summer. 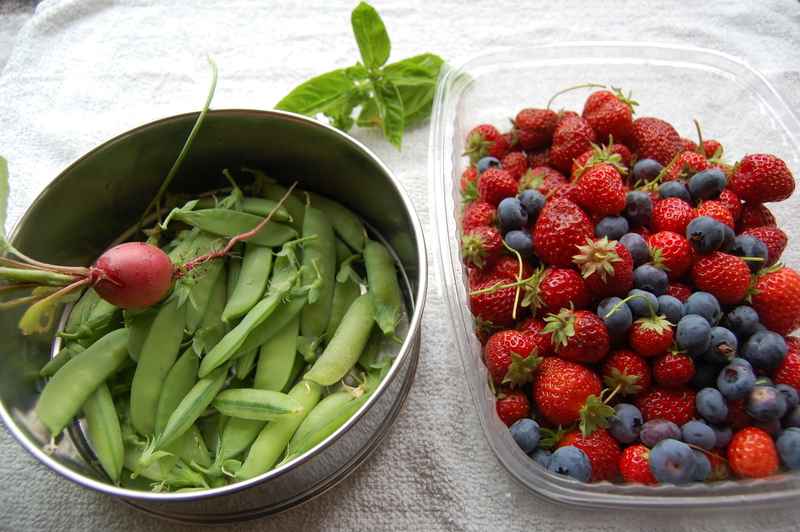 We went out to the garden and were able to pull peas, radishes and berries.